One of the mainstays of cellular device usage that’s constantly changing but always present is the data plan. So prolific are smartphone apps, that they’ve practically become a language by which we navigate our world, but many users still wonder if all of the apps that they’re regularly integrating into their lives use data. That’s a bit of a tricky question to answer, and it’s going to require a little bit of technical training before we’re able to nail down a definite answer. Thankfully, Appamatix has your back in all of these regards. Buckle in, hold onto your butts, and let’s see what’s going on with your day-to-day data usage. It’s difficult to look back and imagine a time that smartphones didn’t have such a resounding, profound impact on our lives. They’ve gone from pioneering luxury items to a standard-fare possession that practically everyone has in their pocket. They’ve opened up doorways in casual lives and professional lives both, and your experience interacting with other people will often be hampered if you don’t have regular access to a smartphone. More so than the personal computer, the smartphone has become the gateway to all things personal, digital, and social. Hand-in-hand with the smartphone, however, also comes the paid data plan that you’re required to purchase from your wireless provider of choice. No matter who you choose to go with–AT&T, Sprint, Verizon, or a different company–you’re going to have to buy into that cellular data package if you want to have a smartphone. There’s no way around it. They’re the wildcard variables that affect every app and action you perform on your smartphone, and in the following guide, we’ll attempt to break it all down in a way that’s easy for you to understand. It’s also important to understand, which is understood by anyone that’s ever had to pay overage charges when they go over their monthly allotment of data. With a firm knowledge of what your apps are going to do (or not do) to your monthly data plan, you’ll become an informed smartphone owner. You might also end up saving yourself a few bucks every month because better management of your cellular data plan can often result in not needing as much of it! When you purchase a smartphone, you’re forced to buy into a cellular data package. Most of the time, your provider will try to upsell you to the most expensive plan that they can based on your needs, but the frugal truth of the matter is that most people can absolutely get by using the minimum available amount of data, every month. It takes some knowledge, some planning, and some trimming of mobile activity, but by no means do you need to sacrifice an ounce of happiness. You know that little symbol up at the top of your phone’s home screen? 3G? 4G LTE? 3 bars? 4 bars? It all works together to communicate to you the current type of cellular connection that your phone has, which is going to determine the speed at which it can access cellular networks and use data. However, there’s one major function that smartphones have that will offset the use of cellular data by all of your apps. Wi-Fi. Oh, yes, it’s all about the Wi-Fi. It might be an obvious thing to many smartphone users, but your mobile device uses a Wi-Fi connection in virtually the same way that a laptop or desktop computer will. When you’re on a Wi-Fi connection, you will be using an absolute minimum of your cellular data, since most smartphone applications don’t take advantage of functions that are limited to mobile devices. Think about it–which features does your smartphone have that a computer doesn’t? …And, that’s it! It takes some examination of these parallels and disparities to realize just how close smartphones and computers are now, and that’s not a coincidence. For many people, especially in developing countries, a smartphone is the only “computer” that everyone can reliably get ahold of. More than that, it doesn’t have the same space or upkeep requirements that typically come along with a Windows PC or Mac, and can be much, much more affordable while often providing the same amount of accessibility. What does this mean for cellular data? It means that the services listed above are the only ones that need to eat into your monthly data allotment. The rest can (and should) function on Wi-Fi as much as you can possibly manage. Which Apps Use Cellular Data? Fortunately, it’s not difficult to see which apps and services on your smartphone are responsible for gobbling up data. Modern operating systems like Android and iOS give users a ton of tools for figuring out how to better manage and control their data usage, and none of them are particularly hard to use. Below, we’ve broken down the steps that you can take to look into your phone’s data usage, which you can then use to determine how you’d like to continue using the app (or more important, where to use the app.) Remember that a vast majority of the apps on your devices can take full advantage of a Wi-Fi connection, thereby saving your monthly data plan from being used up! On your iPhone, tap the Settings icon. From the main menu, select Cellular. This will provide a list of your cellular data information and options, which you can manipulate and adjust as you see fit. The first thing that you’re going to see is a toggle for Cellular Data. 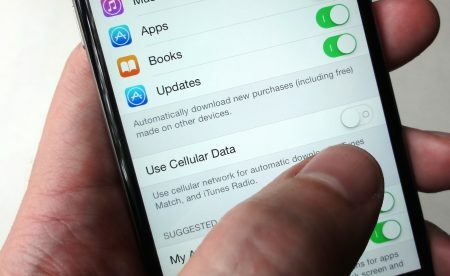 Switching this off and on will disable and enable your mobile device’s ability to use cellular data at all. If you’re coming close to that monthly cap on the amount of data that you’re paying for, turning off cellular data outright can be a smart decision that saves you a pretty penny! Below that is your master list; the comprehensive accumulation of all apps currently on your smartphone that use cellular data. More than that, all of the apps on this list have a toggle that allows you to turn their cellular data usage on and off. Under the name of each app is the amount of cellular data that it has used since your last “reset.” At the bottom of that list are two more important listings–System Services and Reset Statistics. The first will let you view the iOS system services that require cellular data usage, and the second will reset the master list of apps that tracks their data usage. In the case that you want to track data usage over the course of a month, simply reset your statistics at the beginning of that time period, and watch that list closely! The process for accessing your data usage control panel is slightly different on Android, but the basic functions of it are very similar to what you’d find on iOS. Tap on Settings followed by Data Usage. From the list that follows, you’ll have access to many of the same options that you would on iOS. 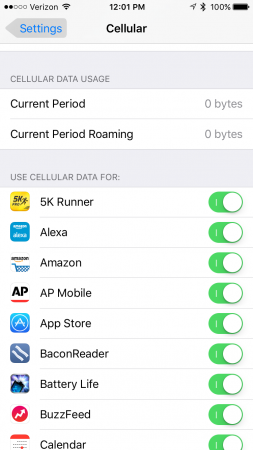 You can scroll through a comprehensive listing of the apps that regularly use cellular data, and examine just how much data they’re using. If there’s one that you want off the list, you can tap on it, and select Restrict Background Data Usage. Given that Android is a far more open platform than iOS, many users circulate the rumor that third-party apps are somehow better at tracking and limiting your mobile data usage. I would highly caution against using any third-party apps to manage such important information, and simply make yourself accustomed to checking this menu regularly. If there are any outlying apps that tend to gobble up a lot of data, you can easily limit them. How Do I Control Data Usage? So, how does one become a better mobile data user? Most of it has to do with examining the apps that are using the most data, but since that’s going to be entirely subjective to each individual user, here are a few tips that I recommend that anyone can use. Follow these, and you’ll stand a chance of significantly reducing your overall data usage. Download songs, albums, playlists, and podcasts from a Wi-Fi network before you head out on the road. Streaming anything on a cellular data connection is going to destroy your mobile data allotment. Limit yourself to checking social media apps when on Wi-Fi, also. This includes Facebook, Twitter, Instagram, Snapchat, and others. These types of applications typically load a lot of image and video content, which demands much more data than you’d expect. Limit as much of your messaging and calling to Wi-Fi connections as you can. Audio calls aren’t going to hurt your data too much, but high-resolution images, videos, and heavy media messages certainly can. Play games on Wi-Fi. Mobile games are notorious for using quite a lot of data, but almost all of their features can work over Wi-Fi, instead. They seem like simple tips, but if followed regularly and allowed to become a habit, they’ll allow you to save quite a lot of data every single month. Ideally, you’ll realize that you don’t need quite such a large data package, and will be able to save some money! If you were ever hung up on whether or not apps used data, hopefully, this article has shed some light on the subject for you. They most certainly do, and if they’re allowed to, apps will use quite a lot of data! If you have any questions or suggestions pertaining to mobile data usage, we’d love to hear them in the comments below. As usual, please consider sharing this article on Facebook and Twitter, so our advice can reach more mobile users!